FULLY PROGRAMMABLE WITH 24 HOUR TIMER - Andrew James Filter Coffee Makers provide you with freshly brewed, aromatic coffee exactly when you want it. INTEGRATED GRINDER - Grind your own beans for bean to cup brewing and extra fresh flavour. 30 MINUTE KEEP WARM FUNCTION - Perfect for top ups! Incorporating style, convenience and performance, this bean to cup filter coffee drip machine is designed to make filter coffee rather than espressos or cappuccinos. With an integrated grinder and a 24-hour programmable timer, the 1.5-litre carafe sits on a warming plate so you don’t need to worry about extra coffee going cold, and can return to it later on in the morning. This digital coffee maker has been specifically designed to conveniently fit onto any worktop or countertop and requires minimal space. This lets you use it in your kitchen, office, cafeteria, or anywhere else where the smell and taste of fresh coffee will be appreciated. What could be better than a freshly brewed cup of steaming ground coffee exactly when you want it? Making your perfect coffee couldn’t be easier. Simply add beans and water then set the fully programmable timer to get your coffee on demand. 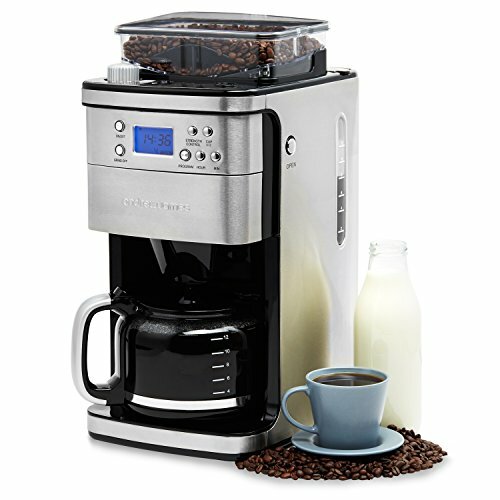 The Andrew James coffee maker is basically a self-contained coffee making unit, that doesn’t require any additional accessories to be attached to it. The Andrew James Filter Coffee Maker can produce between 2 and 12 cups of coffee at a time. A window on the side clearly shows your water level and the hot plate means any brewed coffee in the carafe retains heat for up to 30 mins, so there’s no need to rush and plenty of opportunity for a quick top up. The integrated grinder can be used to grind your favourite beans and the machine then passes it through a reusable mesh, which is far more economical than traditional paper filters. If you prefer to use ready ground or filter coffee, a simple switch to the ‘grind off’ function.